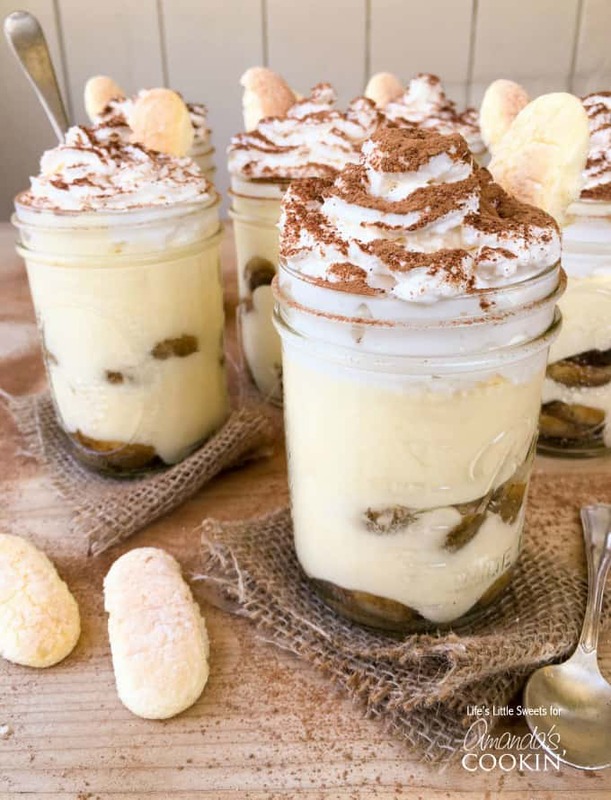 These tiramisu trifles in a mason jar are a slightly different take on our classic Tiramisu Trifle. There’s plenty to go around as this recipe makes 6 pint-sized mason jars, yet it only requires 10 ingredients. Layers of delectable, espresso-soaked ladyfingers, rich tiramisu cream and lofty whipped cream dusted with cocoa; this Tiramisu Trifle is going to be a new family favorite! This tiramisu is my most requested dessert and I’m so glad to share it here first. My French father-In-law, Michèl, a now retired businessman who has traveled and tasted food from all over the world asks for it all the time. When he hears that I am making this tiramisu dessert, he prepares dinner and invites us and several other relatives. And of course, I bring these tiramisu trifles! We all dine together, share funny stories and look forward to the delicious tiramisu that awaits. 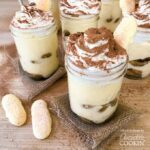 I’ve been making this dessert for years and recently realized that assembling the tiramisu in mason jars makes it much easier to transport! The best part is if someone doesn’t finish their trifle, they can just pop the lid on and they have an awesome accompaniment to their morning coffee. For best results please be sure to read through the ingredient list as well as the kitchen tip section at the end. I recommend getting the best quality ingredients you can, especially for the tiramisu cream layer. I usually opt for organic ingredients when they are available. But don’t worry! No matter what you choose it will taste amazing, because homemade tiramisu is like nothing else! You can substitute ready made whipped cream for the topping if you prefer. When you make the whipped cream, both for the tiramisu cream and the topping, make sure you chill the bowl and the beaters for at least 5 minutes in the freezer. Egg yolks are easier to separate when they are cold. Be sure to bring them to room temperature before beginning. It usually takes about 30 minutes. To speed up the espresso dipping process, separate ladyfingers into sets of two. You can use a mason jar funnel to help keep the top edges of the mason jars clean. Espresso makes a real difference in flavor, however you can substitute a dark roast coffee, such as French roast. Make the espresso ahead of time. Make sure that the tiramisu has been chilled at least 4 hours before serving. I highly recommend chilling in the refrigerator overnight as it works wonders for firming up the cream. However, do not wait longer than 2 days as it may begin to separate. One of these jars is enough to share, definitely enough to indulge yourself, and very easy to save for later or take with you. 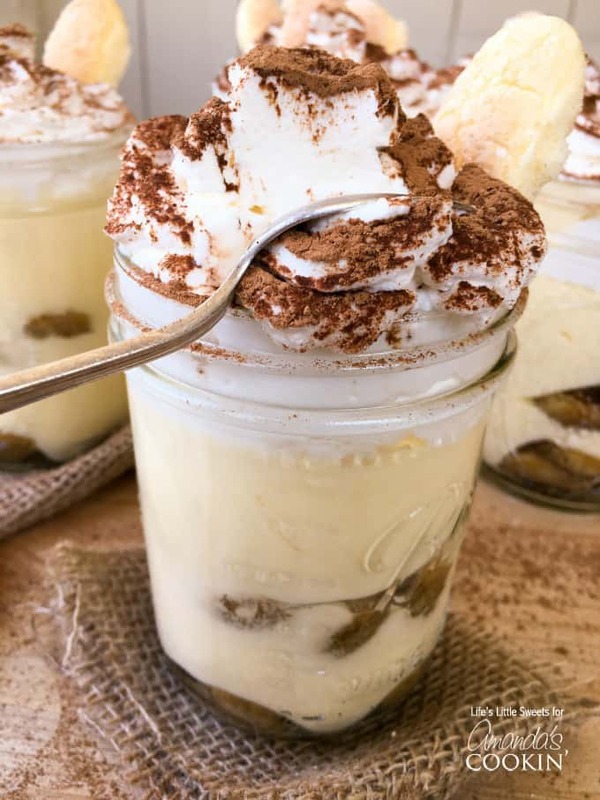 I hope you enjoy these indulgent Tiramisu Trifles as much as my family does. It truly is a special dessert! 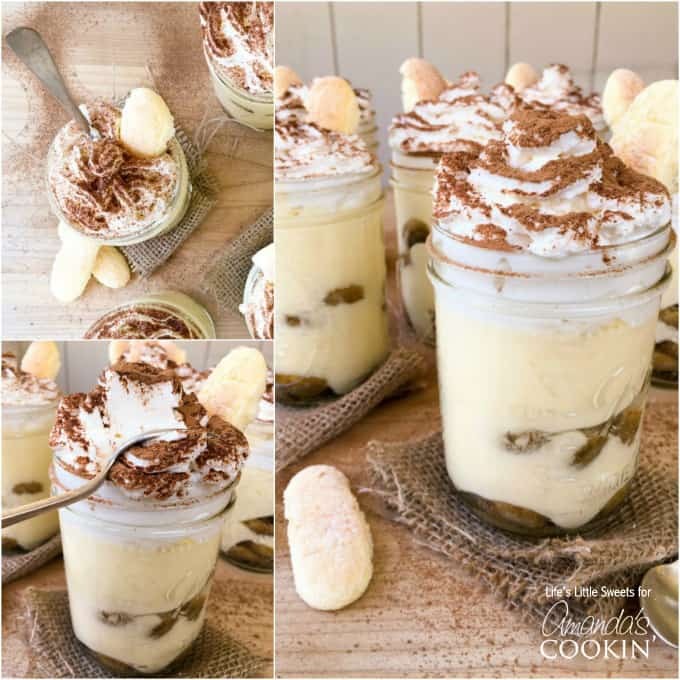 Tiramisu lovers will adore this tiramisu trifle served in mason jars! 2 layers of espresso-soaked ladyfingers, rich cream and whipped cream dusted w/ cocoa. Brew espresso ahead of time (at least an hour) and put in the refrigerator to chill. Make whipped cream (for the tiramisu cream) by combining 1-3/4 cups heavy whipping cream and 1/8 teaspoon cream of tartar (set aside covered in the refrigerator). You can choose to make the whipped cream topping now by whipping the 2 cups whipped cream, 2 tablespoons of confectioner's sugar and 1 teaspoon of vanilla OR you can make this before serving. 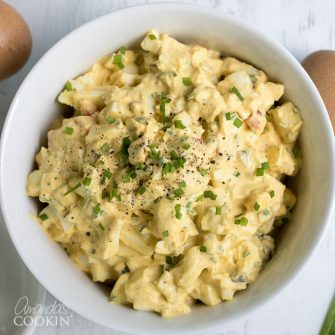 Bring water to a boil in a double boiler, then turn heat down to low, combine 1 cup granulated, sifted sugar with the egg yolks and 1 teaspoon vanilla extract, continuously stir for 10 minutes. The mixture should be smooth. Remove from heat. Using your hand mixer, whip the mixture until it is a pale yellow color and very smooth. Gently fold in whipped cream until incorporated, do not over handle, just make sure there are no streaks. You can cover and set aside in the refrigerator while you set up the assembly link of jars, ladyfingers and espresso. Pour chilled espresso into a shallow dish. Take 2 lady fingers and soak them in the espresso being careful not to over soak. put into the bottom of the 6 jars, add another espresso soaked 2 ladyfingers on top of the first layer. Retrieve the tiramisu cream from the refrigerator, and using a 1/2 cup measure, scoop out the cream and put it on top of the espresso soaked ladyfingers for all 6 jars. There is no need to push it down because it will settle later but gently smoothing it out is okay. Do another layer of espresso soaked 4 ladyfingers (2 over 2) per jar. 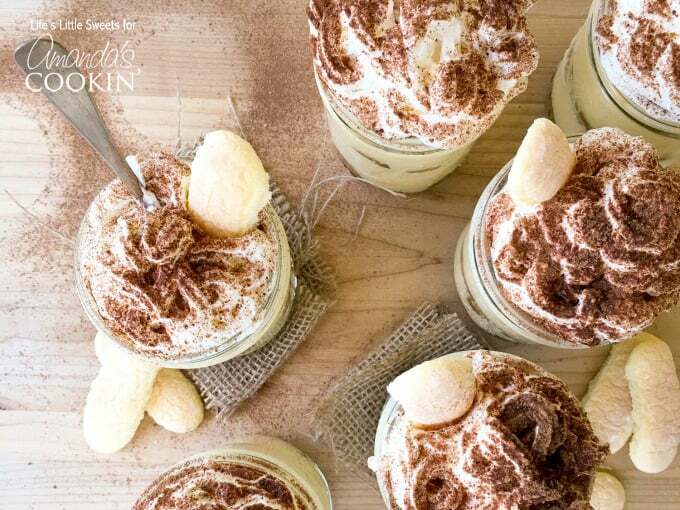 Evenly distribute the remaining tiramisu cream among the jars. If you are transporting the dessert you can cover them at this point and store the in the refrigerator and top them with whipped cream and cocoa powder before serving. You can also add any remaining ladyfingers as a garnish on top of the cocoa dusted whipped cream. Enjoy! It’s sound very good I can not wait to make thank you . Let me know how it works out, I hope you like it Elizabeth! that looks amazing. I will have to try it before canning season.